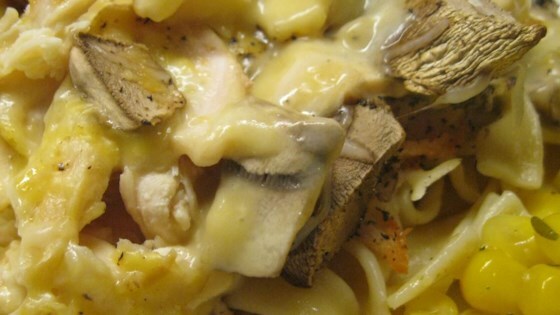 "Cheesy chicken breasts and a smooth mushroom sauce are served over egg noodles." Preheat oven to 375 degrees F (190 degrees C). Lightly grease an 8x8 inch casserole dish. In a bowl, mix the soup and milk. Arrange chicken breast halves in the casserole dish. Top each breast half with a slice of cheese. Pour soup and milk over the chicken. Sprinkle with mushrooms. Bake 30 minutes in the preheated oven, or until sauce is bubbly and chicken juices run clear. Bring a large pot of lightly salted water to a boil. Add noodles and cook for 8 to 10 minutes, until al dente; drain. Serve chicken and mushroom sauce over the cooked noodles. This recipe is so easy. I tried it with Cream of Chicken with Herbs plus added fresh rosemary and thyme. Great. Very tasty & moist chicken. Added some spices before putting the Swiss cheese on the chicken. Baked at 350 for 40 min with foil on dish. It was edible, but we thought it lacked flavor of any kind.